With things moving fast towards January, and the year’s end almost with us, pretty soon we should be able to lay our eyes on the Samsung Galaxy S6. And since the device’s launch is almost upon us, we have been able to lay our hands on what is being said to be the first exposure of the Samsung Galaxy S6. But before we get into that, lets take a look at what’s expected of the next Samsung flagship. The Samsung Galaxy S6 is expected to get Qualcomm’s latest Snapdragon 810 and the Exynos 7 Octa on board, coupled with 4GB of RAM, something that will be a first for smartphones. 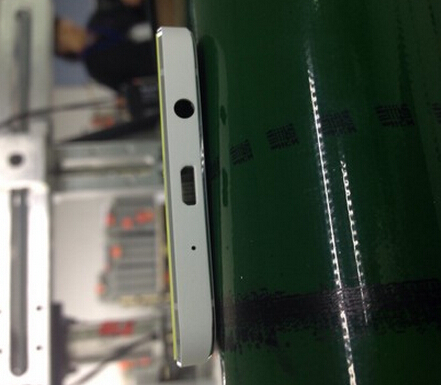 The device is also rumored to come with a dual-edged screen, with the title Galaxy S6 Edge. The Samsung Galaxy S6 is also expected to get Cat. 10 LTE on board, which will provide the device with download speeds of up to 450 MB/s. We’ve also seen some images of the Samsung Galaxy S6 straight of the assembly line, and today’s images seem to (apparently) continue the cycle. Alleged Samsung Galaxy S6 Prototype For Testing Purposes Spotted In India. If today’s news is to be believed, then Samsung is aiming really low for its next flagship. 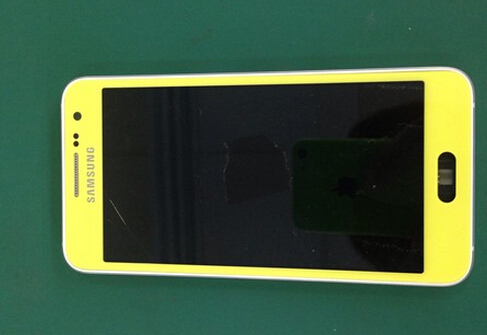 The Samsung Galaxy S6 has been allegedly photographed in florescent yellow for the first time, and the device pictured above comes with rather unimpressive specifications. In fact, the cargo manifest that comes along with the device is similar to the one spotted three days ago. The device being said to be the Samsung Galaxy S6 comes with the Snapdragon 801 on board and is running Android 4.4 KitKat. It also has a screen size of 5.5 inches and a resolution of 1920 x 1080. While these are specifications worthy of good performance, it is highly unlikely for Samsung to equip its flagship device with such performance figures, especially given that the company is facing some difficulties when it comes to revenues. So don’t get too excited by looking at the images above. Its very much possible that this is one of Samsung other devices aimed at capturing mid-level category of the smartphone market, given the company’s vicious expansion of devices for all segments expected next year. Samsung already has launched the Tizen Z1, a $90 smartphone in India and the Galaxy A7, expected to come with the Exynos 5433 on board. Stay tuned, we’ll keep you updated.